Condition: Good for age. Minor low pile. Notes: The Qashqa'i are nomadic herders who transmigrate between the high Summer pasters of the Zagros Mountains in southern Persia, and the Winter pastures of the Persian Gulf. In their oral histories, they claim to have come from Chinese Turkestan, sweeping across Afghanistan into Persia on the vanguard of the armies of Ghengis Kahn. Once in Persia, the Qashqai chose to live in the mountainous region of Azerbaijan, in the Caucasus, far to the north of their present southern Persian location. Early in the 16th century, the Qashqai relocated to the Fars province, their habitat over the past 400 years, probably under the subjugation of Shah Isma‚Äôil, who wanted to create a human buffer against the Portuguese, who threatened his Persian Gulf shore. Although for the most part a group of loosely related Turkic tribes, the actual tie between the numerous Qashqai subtribes is political in nature. Around the year 1600, under the command of Shah Abbas, Jani Agha Qashqai took on the task of bringing order to the various Qashqai groups. To achieve this, he formed the Qashqai Confederacy, an elaborate structure which survived far into the 20th century in the face of over 300 years of almost continual political upheaval in Persia. Part of the Confederacy‚Äôs long term stability is due to its willingness to assimilate neighboring peoples of varying ethnic origin. It provided a melting pot which embraced groups of Kurdish, Lor, Afshar and Arab heritage. Each of these peoples has had a significant effect on Qashqai rug weaving. They managed to retain many traditional aspects in their weaving long after other tribal enities had given in to coarser commerical structures and cheap chemical dyes. 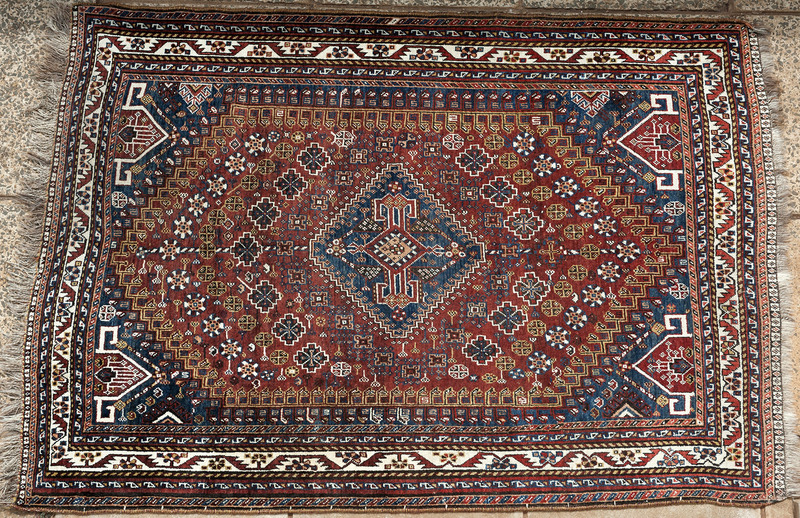 This is a classic Qashqa'i design with central medallion surrounded by a wealth of tribal motifs and stylized flowerheads. A little unusual in that the corner 'spandrels' are truncated, whereas they are more usually presented in their 'whole' form. The natural dyes used here are beautiful and lend a vitality and shine to the piece, enhanced by the glossy hand-spun highland wool. Good Qashqa'i tribal pieces are becoming ever-harder to find, and this one is a gem.